British Museum will open a new Ancient Egyptian gallery centered round the spectacular painted tomb-chapel of Nebamun. On 2 December 2008, the British Museum will open a new Ancient Egyptian gallery centered round the spectacular painted tomb-chapel of Nebamun. 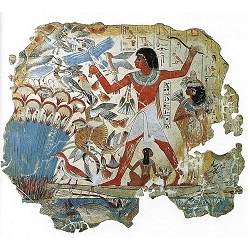 The paintings are some of the most famous images of Egyptian art, and come from the now lost tomb-chapel of Nebamun, an accountant in the Temple of Amun at Karnak who died c. 1350 BC, a generation or so before Tutankhamun.